Jessica Mitchell is in her fifth year of graduate school at Harvard University in Prof. Peter R. Girguis’s lab. She loves thinking about all of the amazing things microbes can do. For example, symbiotic associations with microbes can expand the metabolic repertoire of other organisms, influence local geochemistry and the ecosystems in which they live. This led Jessica to study the chemosynthetic bacteria that live in symbiosis with hydrothermal vent tubeworms such as Riftia pachyptila. These incredible symbioses form the foundation for many vent (and seep) habitats. 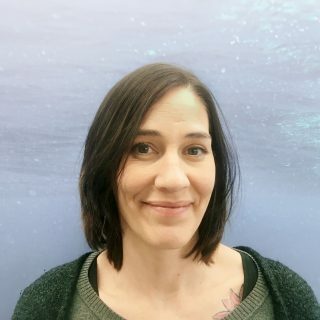 She became interested in the ecological role that microbes play in geochemical cycling and habitat structuring when she was an undergraduate at UMass Boston, where she worked with sediments in Prof. Alan Christian’s freshwater ecology lab. This will be her fourth research cruise to a hydrothermal vent system. She has never been to Guaymas basin and is extremely excited to work in this unique area that has both vents and seeps within a short distance of each other!